And finally, a device that not only works well, but also does good. Buoy is a contraption that attaches to your home’s incoming water line and is able to provide hard data about how much H20 you are using, and more importantly, wasting. Buoy can detect potential leaks in real-time and even allows you to shut off the flow immediately in a crisis through its proprietary app. It also breaks down what appliances are using exactly how much water (toilets, dishwater, etc.). Company CEO Keri Waters (I kid you not) says the average household is losing 10 percent of the flow to leakage, and that’s money going right down the old drain-ola. An AI that watches your water bill: Buoy’s device looks like, well, a buoy, but this gadget is about saving water, not floating in it. The device fits onto your home water system and talks to an app wirelessly. It monitors your home water usage and offers feedback about how much H20 you’re using in your showers and other activities. And because the AI learns what normal water usage looks like, it can tell when you spring a leak and will automatically turn off the water main. Starts at $800. Buoy is a smart home water device that uses AI and machine learning to let you better understand your home water usage, make smarter decisions, and shut off leaks with an app before they drain your budget or destroy your home. We like how this system can help consumers easily manage their home’s water usage and show you where you can save money without having to give up some of the things you really like to do, like having hot showers. We also like how, as part of the cost of the product, you get a licensed professional plumber to install it for you. 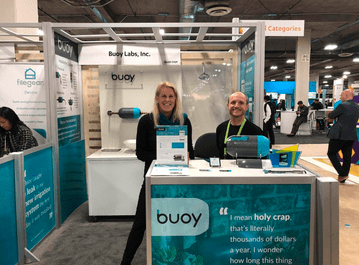 Buoy is shipping now and costs $799.00; this includes one Buoy device, worry-free installation by a licensed plumber, and a lifetime data subscription to the Buoy service.